Some days are for cooking low and slow and savoring all the moments in the kitchen. And then there are THOSE days. You know the ones where everyone starts out late and just can’t seem to catch up. Even on those days, I make every effort to eat well and at home as much as possible so I have to have a stockpile of recipes that can be made with little to no effort and with items I have on hand. 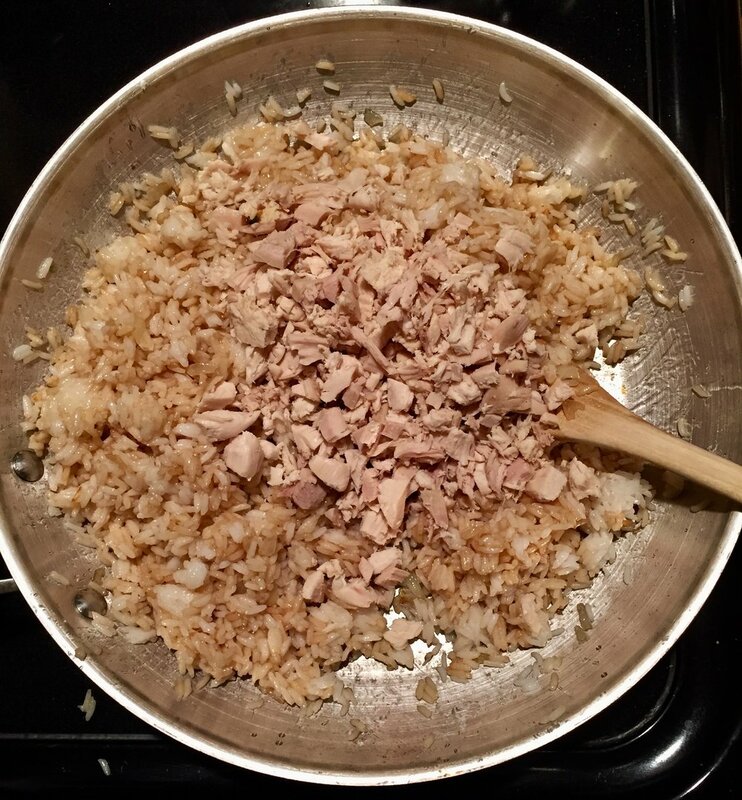 For us, chicken fried rice is a staple in this fast fixes category because I almost always have leftover chicken and rice in my refrigerator so with a few more add-ins and about 10 minutes I’ve got dinner in the bag! As with many of my “fast fixes”, sticking right to the recipe is not a requirement here. If you have leftover pork, throw it in! Not a meat person, throw in some tasty veggies that can handle high heat and make this one veggie fried rice. The idea is to get something good, fast and delicious on your table without having to visit the drive through or the frozen food section. And with the holidays barreling down on us, fast is the name of the game many nights! Now go raid that refrigerator and let’s make some rice! Cook until heated through, remove from heat and add salt and pepper to taste. Garnish with green onions or peas (if using) and serve! Cooking the rice in advance will give you much, much sticker rice which makes it easier to work with when making it into fried rice. But if you have a craving and have no cooked rice on hand, all is not lost. You can still cook the rice and allow it to cool for a bit before making the fried rice it will just not stick together as well when eating. You will also need to allow time for preparing the rice to this recipe. If you do not have cooked chicken on hand this is not something to worry about. You can prepare the chicken as you normally do then prepare the fried rice. If you do prepare the chicken the same day, a dash of soy sauce or sesame seed oil gives it a nice boost of flavor! Sesame seed oil can be found in the Asian section of most grocery stores. It is not necessary to the recipe but I find it really gives the rice an extra WOW factor so if you can get your hand on some, do! It also has a remarkably long shelf life of at least a year and does not need to be refrigerated.